The Chaotian Palace, is located in Nanjing, China. It was built as an imperial palace in the Ming Dynasty, and today it is the Nanjing Municipal Museum. The palace covers an area of more than 70,000 square meters. The total building complex consists of three lines, with the central complex being the Wen Temple, which was built with precious materials, and the its yellow glazed tile was from Jingdezhen, Jiangxi province. Inside the palace, there are more than 100,000 cultural relics in collection. The place was once the Imperial Central University (Zongmingguan) in Song Dynasty of Southern Dynasties. Chaotian palace was first built by Hongwu Emperor in late 14th century during the early Ming Dynasty, and it was used primarily by members of the royalty for ‘veneration of ancestors’. The complex was burnt down during the Taiping Rebellion, and the present buildings were built from 1866－1870 when Nanking Academy (Jiangning Fuxue) moved there from its former site south to Qintian mountain. The palace contains many halls, and was once used as a Confucian academy, and contains numerous important structures. Today, the palace is a popular tourist attraction in the city. 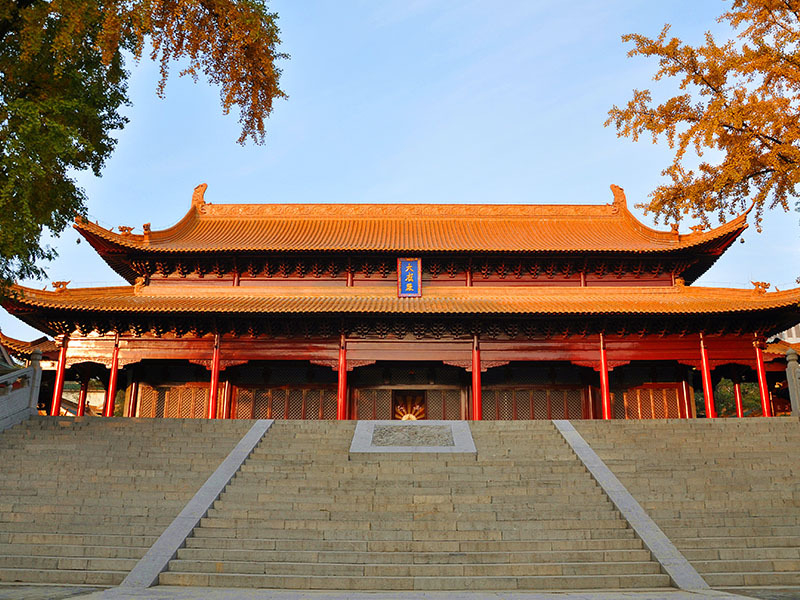 On the west side of Chaotian Palace scenic area is the memorial temple of Bian Kun, the famous minister of the Eastern Jin.